It’s well-known that the Danes have a knack for design, so perhaps it’s little surprise that their smorrebrod, the open-face sandwich that we’ll go ahead and call their national lunch, is so artfully presented. The word smorrebrod (whose pronunciation doesn’t translate well to English—just listen to a Dane say it), derives from smør og brød, or “butter and bread,” and while the smorrebrod tends to start from those two staples, there’s far more to it than that. Like so many culinary innovations, the smorrebrod was born from necessity. Back when white bread was still a luxury, rye was the food of the working masses. Buttered rye bread was a staple, whether plain or topped. The smorrebrod we know and love today might come layered with herring, either pickled or curried; egg and shrimp, pork liver pâté, roast beef and remoulade or fried plaice—essentially, every manner of seafood and meat imaginable. As smorrebrod occupy such a prominent place in Danish eating culture, they run the gamut from simple to lavish. A straightforward sandwich of cold cuts might be a weekday lunch, whereas celebratory meals—especially around the holidays—might find the family table groaning with a spectacular smorrebrod spread that starts with herring, progresses to eel and moves on from there. Though special occasions call for elaborate garnishes, even the simplest smorrebrod tend to be artfully presented. 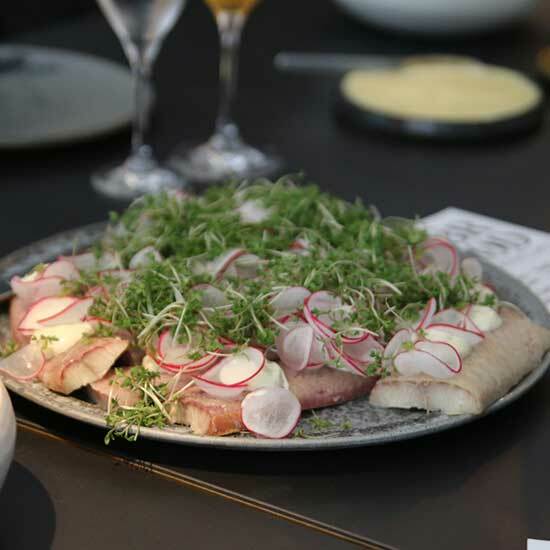 And even simple smorrebrod call for a drink alongside—ideally, Danish snaps, akin to schnapps. Make sure to shout a healthy Skål!—a toast to the table—with every sip. Ten years ago, Americans didn’t give much thought to Danish cuisine at all. But more recently, with the rise of restaurants like Noma, New Nordic cuisine is not only talked about, but held up as some of the world’s best. But as the smorrebrod indicates, Denmark has a lot more going for it than just its award-winning chefs and restaurants. In the same way that a lot of top American chefs have embraced the humble hamburger and transformed it into a refined dining experience, the Danes are pushing the boundaries of what it means to be a smorrebrod. Newer venues take creative liberties with the classics, modernizing the standards. But Copenhagen’s old smorrebrod establishments are worth a visit, too. These tavern-like places tend to be open only for lunch, tend to feature menus of all the smorrebrod’s greatest hits and tend to have the kinds of waiters who look like they’ve been there for 40 years. Just be sure to make a reservation: Many of these venerated restaurants book up well in advance. When imagining the smorrebrod, start with the bread. Forget the often-lifeless rye bread we Americans are used to seeing at delis. The Danes should rank among the world’s great bread-baking cultures, and their rye bread is remarkable. Danish rye is dense but surprisingly moist. It’s so substantial it’s easy to see how it was once a meal in itself. Though some smorrebrod shops have popped up in the States, there’s no substitute for the sandwich in its native land. Here are three spots to try in Copenhagen. Øl & Brød. From the folks behind the famed beer Mikkeller, Øl & Brød (“beer and bread”) specializes in the modern smorrebrod, paying homage to traditional ingredients and flavor combinations prepared in novel ways. The egg and fresh baby corn with dried goose breast is a must, as is whatever beer or aquavit your server recommends as a pairing. Restaurant Kronborg. A cozy establishment right in the center of the city, Kronborg is an ideal first stop for the smorrebrod neophyte: It’s low-key and charming, with helpful servers, a classic smorrebrod menu, and an impressive list of aquavit, many of which are made specifically for the restaurant. Don’t miss the smoked eel with scrambled eggs or the Danish meatballs with red cabbage. Restaurant Schønnemann. Make a reservation for lunch and get ready for a trip back in time at Schønnemann, a legendary Copenhagen eatery in operation since 1877. If you want to experience the smorrebrod lunch in all its Old World glory, this classy establishment is a great bet. Settle in for herring, smoked eel, fried plaice and plenty of snaps.